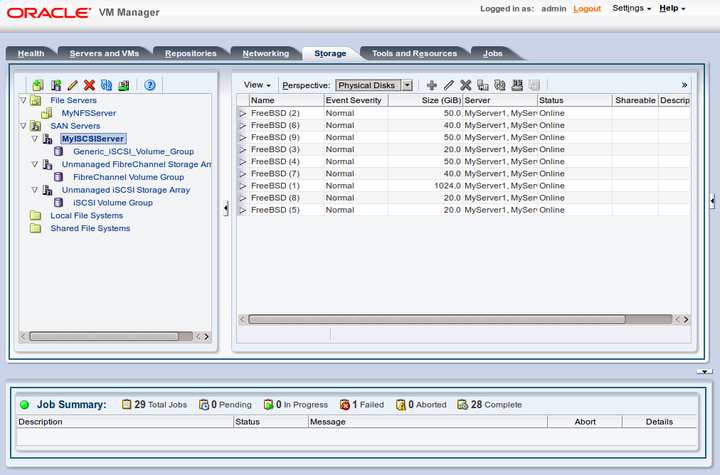 Oracle VM Manager communicates with all storage through a set of plug-ins, which are part of the Storage Connect framework. These plug-ins are not actually run from the Oracle VM Manager but rather live on some or all of the Oracle VM Servers. You can see these plug-in files in the local file system of an Oracle VM Server in the /opt/storage-connect/ directory. In the Oracle VM Manager user interface you select an available plug-in when creating and configuring storage elements for use in your environment. As you can see in the Storage tab in Figure 4.1, “Storage tab in the Oracle VM Manager user interface”, storage elements are logically divided in File Servers and SAN Servers. This distinction refers to the difference between file-based storage and block-based storage, or raw disks. Both types of storage are supported and Storage Connect plug-ins are available for each category described in Section 4.2, “Storage Types”. Furthermore, Storage Connect plug-ins are split up according to the functionality they offer: there are generic plug-ins and non-generic plug-ins, also referred to as vendor-specific plug-ins. Generic plug-ins offer a limited set of standard storage operations on virtually all storage hardware, such as discovering and operating on existing storage resources. We categorize these operations as 'passive' in the sense that they do not interact with the storage management but simply detect the available storage architecture and allow it to be used in the Oracle VM environment. Vendor-specific plug-ins include a much larger set of operations, which also includes direct, active interventions on the storage hardware: snapshot, clone, create LUNs, resize, and so on. To execute generic storage plug-in operations, only an access host or fibre channel connectivity is required (for iSCSI: typically a host name or IP address with a port number). The non-generic plug-in operations require an additional admin host, with optional administrative user name and password, granting Oracle VM Servers, with the appropriate plugin installed, direct access to the configuration of the storage hardware. To install vendor-specific plug-ins, see Section 4.3.1, “Installing Storage Connect Plug-ins”. Vendor-specific (non-generic) storage connect plug-ins are available directly from your storage vendor. A complete list of vendor-specific plug-ins is available here:https://wikis.oracle.com/display/oraclevm/Oracle+VM+Storage+Connect+Plugins. Storage connect plug-ins are delivered as an RPM, usually a single RPM, but your storage vendor may provide multiple RPMs. When you have the storage connect plug-in RPM from your storage vendor, install the RPM on your Oracle VM Servers. You must install the RPM on all the Oracle VM Servers that will use the particular storage. If you are installing or upgrading a storage connect plug-in on an Oracle VM Server already managed by Oracle VM Manager, rediscover the Oracle VM Server to update the database repository with the latest configuration information about the Oracle VM Server. Read the install and configuration documentation for the storage connect plug-in from your storage vendor before you install and use it. There may be extra configuration required that is not documented here.